This video will show you how to hook in early, shuffle back and plant all your weight on the boom to initiate early planing the lazy way - without any prolonged strain on your arms. 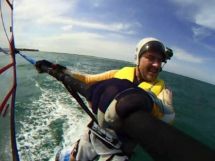 This video will show you how to manage and control your rig, as well as how waterstart by plonking your feet on the deck and letting the sail do all the work, lifting you up out of the water and onto the board allowing you can hook straight away and initiate early planing the lazy way - without any prolonged strain on your arms. Getting into the rear outward footstraps on wide boards can be a real challenge for sailors with big feet. But as soon as you get both feet in, you will enjoy the thrills of increased speed and control. Here is how I manage to do it. 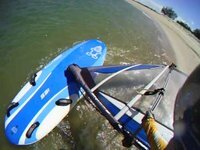 The first step in a sucessful beach or water start is to recover the rig and position the board and sail. 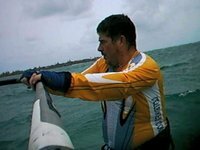 Here are a number really handy techniques I have picked up from other windsurfers. He has been quietly practicing for some time, and while they may not look pretty, at our last session Gavin was nailing his gybes most of the time. Today I took my daughter Mercedes out for a wind surfing lesson. 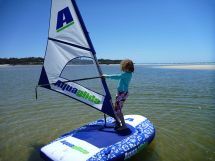 We used the Aquaglide Multisport, which I can highly recommend as a teaching aid. Being able to kneel on the back and coach your child to develop their skill and technique turned out to be a really safe and effective approach. 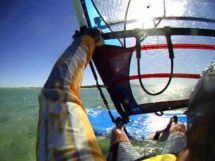 Learning to waterstart is one the core skills of windsurfing. 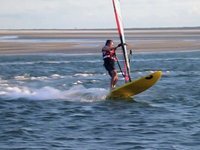 I only learnt to do it earlier this year, so I thought I should pass on the tips I got from other windsurfers, while they are fresh in my memory. 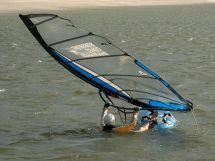 Experienced windsurfers forget what its like to be a clueless beginner. 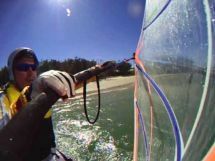 This is me back in March (2010), learning how to plane - one of the most enjoyable aspects of windsurfing. This is a rather funny video of me back in January (2010), making lots of (what now seem obvious) mistakes and falling in a lot. I post it for the benefit of other beginners, to provide them with a bit of light hearted encouragement.